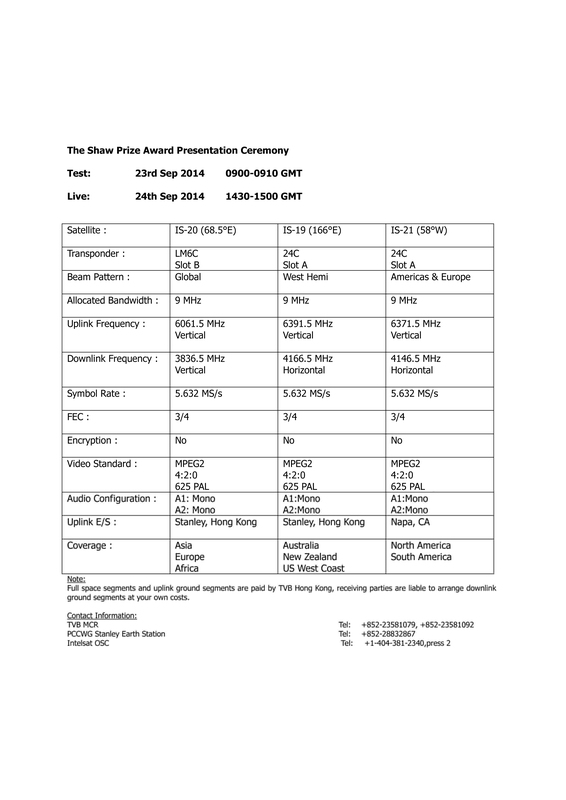 The Shaw Prize Award Presentation Ceremony 2014 will take place in Hong Kong on Wednesday, 24 September 2014. The Honourable C Y Leung, Chief Executive of the HKSAR, People’s Republic of China has kindly consented to officiate at the ceremony. An approximate 5-minute segment will be uplinked via satellite transmission at Hong Kong time 2230-2300 (GMT 1430-1500). Photos of the ceremony will also be uploaded onto the website www.shawprize.org from Hong Kong time 2230 (GMT 1430) from 24 September 2014 onwards.